Plastic cups, regardless of whether the disposable plastic cups or more ROBUST colourful plastic cups, they are cheap and are always needed anyway. The purchase is worth its money. Alternatively, you might find that there are always plastic cups around to play a few games. Especially season games and skills games are popular with the plastic cup games. Especially the fine motor skills, balance, stamina and skill are particularly challenged in the games below. In the games’ collection of cup games, these games are currently recorded. A cup filled with water is picked up with the mouth and passed on by mouth from person to person. The last person empties the contents into a measuring cup. Which team fills up the measuring cup first? If you think playing the above game is to unhygienic, you could play this variant: Each team member gets an empty cup. One cup is filled at the beginning and then poured from on cup into the next. The last player pours the rest into a measuring cup. balanced across an obstacle course. A full cup of water is placed on a TT-bat and has to be balanced across an obstacle course. What is still in the cup at the end of the course is poured into a measuring cup. Again the team wins, which team fills up the measuring cup first? 10 cups of water, filled to the brim with water are placed on a tray. Now they have to be balanced over a course of maybe even a simple lane. If you chose the simple lane, try balancing the tray in just one hand. At the end of the course, using the other hand, the remaining water is filled into a bucket. The team who fills up the bucket first wins. Again, 10 cups filled right up, however, this time, they are placed on a board, about 150cm long and 10cm wide. Two people lift up the board and carry it across the course to the finishing line. In the end, all remaining water is filled into the bucket. Using rubber bands and paper staples, a stack of cup gets shot down. How many cups will fall if you have 10 shots? Using rubber bands and paper staples, a stack of cup gets shot down. Several cups are stacked up in a distance or 1-2m. Using a water pistol (doctor syringe) try to get water into the cups. For the cups not to fall, they can be secured by appropriate wooden slats. Alternatively, you can crowd them all together as well. Build a high pyramid with cups. If not as many cups available, build based on time. Within 30 seconds, build a high pyramid, without the cup pyramid to collapses. Put a beer mat on top of a cup. On the beer mat place two cups. Then on top again you place more beer mats, followed by cups again. The third row of cups should as well hold 3 cups. Keep going in this manner until the pyramid collapses. Alternatively, how long does it take to build a 3 or 4 story cup pyramid? There are cups stacked on top of each other, (not in each other but on top of each other. Given 1 minute who can build the highest pyramid? Alternatively, how long will it take to stack 10 cups on top of each other without the tower to collapse? Put up 3-4 cups, then cover them with a carton, (Book, A4 cardboard) and out up another 3-4 cups. How many stories can you build in a certain amount of time? Alternatively, who creates the highest tower. Try to flick a knot in a cup of water, using a coin. Throw a table tennis ball in such a manner, that it bounces once before in lands in the plastic cup. The distance from the pitcher to the plastic cups can individually be arranged. Place a coin on the handle of the spoon. Then gently push the spoon down so that the coin is catapulted into the water cup. A pea (or chestnut) is placed between the knees. The candidate has to run with the pea between his knees to a cup on the bottom and tries to drop the pea into the cup. However, if the pea falls on the floor, the candidate has to start all over again, or the next child starts. Which team drops the most peas (chestnut) in the cup? 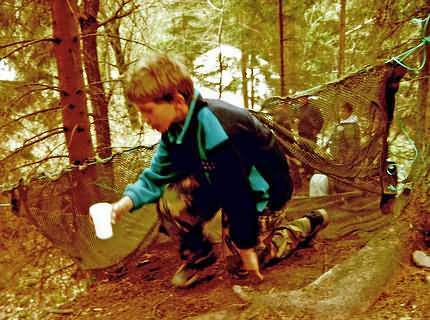 Obstacle course with water filled plastic cup. Put a plastic cup on the table. Using an air balloon, you need to “blow” the cup to the opposite edge of the table. The balloon can be inflated several times. How long does every kid take for this task? Alternative: using little building blocks create an obstacle course on the table. However, instead of using a balloon you use your own air and blow the cup across the table. If the cup falls over, you need to start all over again. Using a nail, make 1 -5 holes in the bottom of a cup. The objective is to transport water from A-B. Depending on water loss and speed, the fastest team wins. Take 10 cups and build a pyramid 4-3-2-1 (or 3-2-1). Now pour water in the top cup. Keep on pouring until all cups are full. Whoever fills all cups fastest without the pyramid collapsing wins. Two players stand within 2m distance. One throws (chestnuts, coins, stones), which the other has to catch with a cup. How many objects can be collected within one minute? The items must remain in the cup (or can be stored, which is easier for the next attempt to catch).